Evergreen shrub. Slow growth. 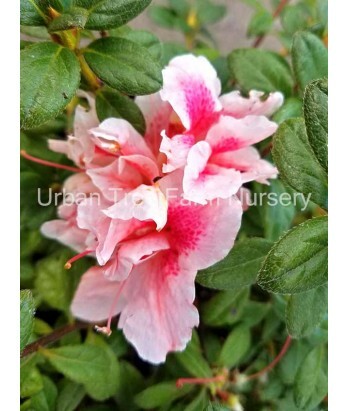 Slightly more sun tolerant than other azaleas. Dark green summer foliage and bronze winter foliage. Soft pink bicolor semi-double bloom flowers. Blooms in spring, then reblooms again in fall. Regular water needs in well-drained soil once established.